First, sorry to some of my viewers who complain about the excessive coverage of food.. The reality is that this is one of the most culturally different aspect from HK’s or Europe’s or other places’..
On the picture you have a plantain fried with cheese, served with a steak. Who knows why they do that.. The weirder way to describe it would have been ‘banana with cheese’. But it really wasn’t as bad as it sounds. I told a Colombian that we have papaya soup in HK. Papaya, boiled with peanuts and pork. The reaction was a sick face. Papaya is widely consumed here, not in soup, but as a fruit. She couldn’t put pork and papaya together. It’s the same problem for me. Banana and cheese together would have been far-fetched even for the imaginative. Well, they have avocado soup here – avocado is a fruit so that’s like the Chinese papaya soup. I am yet to try the avocado soup.. So my next mission is to make papaya soup here in Colombia to spread Chinese culture. So, back to banana and cheese.. It really wasn’t too bad. 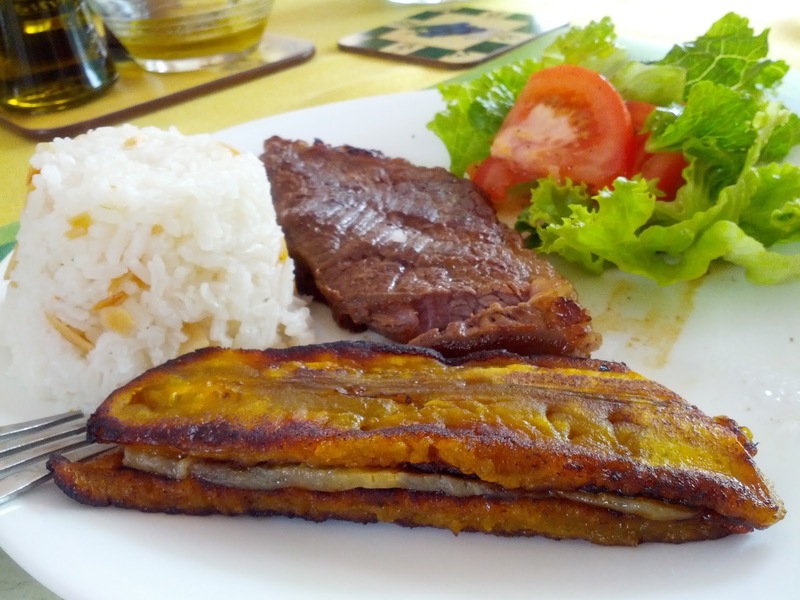 The plantain isn’t so sweet, even though it’s the sweet version (maduro – ie mature, so it’s slightly sweeter than platanos, which are really the same fruit but when green and are used for different plantain dishes like patacons) – see my other article. The puzzle is that if you ask a Colombian if the yellow matter is platano maduro or platano – they would be able to tell you! Just like how Asians can tell if someone is Japanese or Thai or Chinese! The cheese here is, to put it mildly, tasteless, more for practicality than the connoisseur, so it didn’t have such an adverse effect when put between two slices of banana..